Rising from the deserts of the Middle East like an ancient monolithic demon-god held aloft by scorching desolate winds, enveloped in a sweeping tornado of frenzied sand flaying flesh from bone and raining down ancient wrath with malevolent fury, NERVECELL confidently & consistently unleash fierce riff-laden brutal Death Metal interwoven with ancient traditional Middle Eastern music, bringing the unique distinction of their homeland into the fray of original Death Metal. Much like peers such as MELECHESH, NERVECELL have meticulously crafted distinction into their potent brutality by rooting it in the ethnic musical & historical culture of their ancestors, capturing foreboding atmospheric darkness in a deft blend of regional instrumentation & song structuring with an endless flow of eviscerating Death Metal with a savage consistency very rarely seen in today’s overcrowded industry. Unleashing the EP Human Chaos in 2004 by guitarists Rami Mustafa & Barney Ribiero and bassist/vocalist James Khazaal, NERVECELL rose from the Middle East in the wake of global disorder and violent distrust throughout the world, their music a powerful statement that we are all human and geographic, ethnic & racial difference are irrelevant in the face of the power of Metal - a common thread shared by people across the globe, intimately binding and far stronger than superficial differences and capable of bridging any cultural gap. 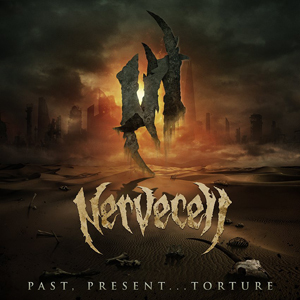 In the years since they have released two full length seminal Death Metal masterpieces (Preaching Venom and Psychogenesis) supported by exhaustive touring across the globe (with the sad exception of the US, where previous attempts to book touring have fallen through) that has established NERVECELL as a fan’s band, never skimping on the quality brutality and ever-humbly sharing their passion at every opportunity. Grab your copy of Past, Present...Torture in the KNAC.COM More Store right HERE.